The crash happened around 3:50 a.m. on the Outer Loop in College Park, Maryland. Maryland State Police said a driver lost control of a Chevrolet Traverse. When the SUV spun out, it crossed into the path of a tractor-trailer that was unable to avoid a collision with it, police said. The Traverse was pushed across all lanes of the Outer Loop and hit the concrete median. Those in the Traverse were trapped inside and had to be extricated, police said. 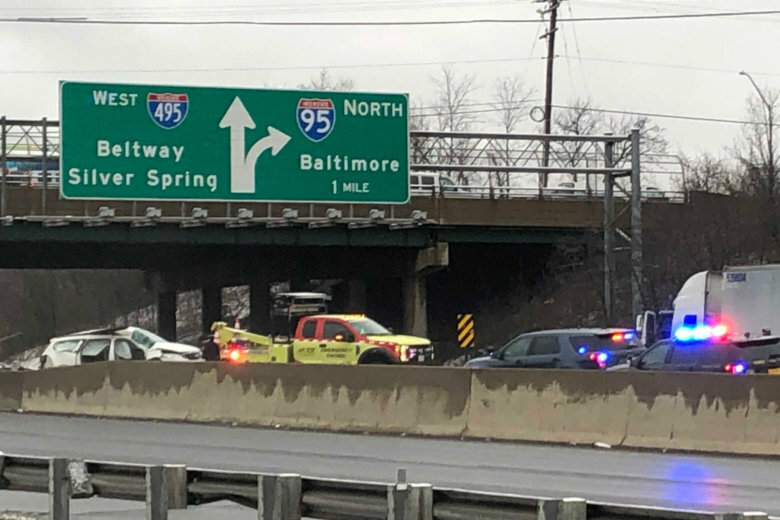 Police have identified the front seat passenger who died at the scene as 47-year-old Linh Khuong, of Silver Spring. The driver, 49-year-old Hoang Nguyen, and another passenger, 49-year-old Duoc Vo, both also from Silver Spring, were taken to the University of Maryland Prince George’s Hospital Center. The tractor-trailer driver, 60-year-old Leroy Ritchie, of Capitol Heights, was not injured, police said. Police said their was no indication that the drivers were impaired. After the crash, traffic was diverted onto the exit for U.S. 1 for several hours; police said all lanes reopened by 8:30 a.m. Police continue to investigate the crash. WTOP’s John Aaron reported from the scene of the crash in Prince George’s County, Maryland. WTOP’s Colleen Kelleher contributed to this report.